Mozart, Beauty & Grapes – PUT THAT IN MY FACE. I seem to become inspired quite a bit with my surroundings. And I’ll be honest, that inspiration may not amount to a ton of productive activity. But in my mind, I can’t help but stop and notice how beautiful something is and acknowledge that if I had more time in my life available, I would do something with the beauty that I was witnessing. I would write something derived from my inspiration. Perhaps, create a piece to reflect what I saw. I have always been one to stop and smell the roses, it’s a secret I keep no longer, that I am now relinquishing to the world. Most people think of my personality as constantly going at one hundred miles an hour, however, if anyone could ever step inside my garden they would see those reflective moments I steal when I am all alone. For me, Italy was filled with these moments. These quaint gems of sudden and flawless beauty. Sitting right before me without another soul in the world (well except my screaming children) to notice it. And sometimes, the universe would line up and even my two-year old seemed to take a second just to look at all the glory that was around our bodies. Italy, for me, was a complete dream come true. It is something that I have wanted to see since I was a little girl and longed for as a young adult. I felt at home there. Just enough in fact, that I could see myself settling there in another life. I have always felt as though I belonged somewhere else and I think Italy, may just be the place. I didn’t get to run while I was there which saddened me greatly (too dangerous, the roads, the drivers, yikes) but I did have plenty of time to miss running which I think I needed. 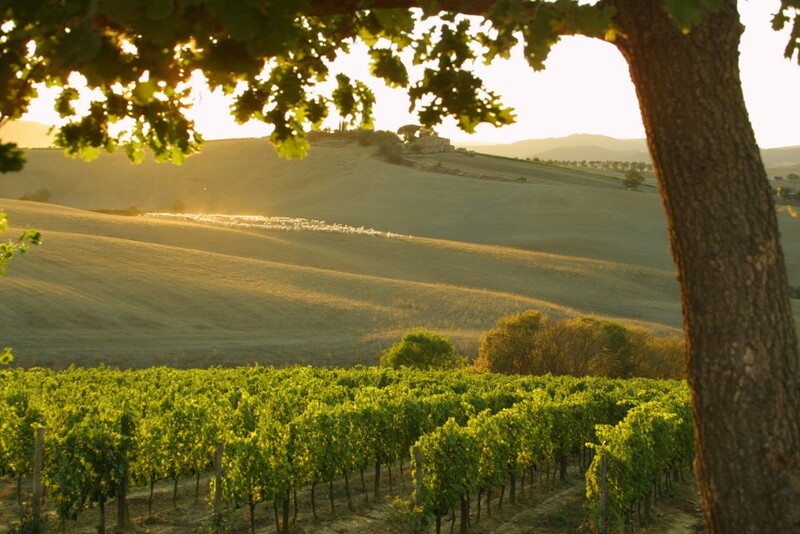 Amongst the region of Tuscany there are probably hundreds of vineyards. They all try to lure you in with big signs that say “buy direct” or “wine tastings” and maybe that is fine for some but I wanted something different. And, thanks to my very perceptive husband, I found it. Nestled on a mountain side, or so it seemed driving up there, was a tucked away vineyard, seemingly in its own world. When we drove up to Paradiso di Frassina, we immediately noticed the music playing. Speakers, throughout the olive groves and the vineyards, towered over the plants, playing beautiful music. Mozart to be exact. It brought me back to my youth, when I would listen to classical music while completing my homework. It also brought back a brief moment of serenity. Something I don’t get to experience that often. The music made the landscape so much more dramatic. The olive trees were covered with olives and the grape vines had large clusters of purple grapes, ready for harvest, which was to happen any day now. The gentleman who greeted us, from what I perceive was his home, was warm and welcoming. He provided us with a tour of his modest production and allowed us to taste three of his wines, with lots of information to go with the glasses. Everything we experienced was delicious and I immediately wanted whatever he was selling. Every year, they only produce 400 bottles of olive oil, he had ten left and I bought 2 of them before he even finished his sentence. Immediately, I wished I could buy more, if I had enough space in my suitcases, I would have bought them all. The olive oil is packaged just as the wine is and happens to be the most incredible, luscious, robust olive oil I have ever had in my life. And each bottle was only $12.90! In America, that would never fly. We bought 4 bottles of wine from him, again, wishing we could purchase more. In Montalcino, wine gets very expensive and some of the producers of Brunello di Montalcino wines have very up-scale, fancy productions. Which I think, they have to when catering to such a discerning audience. Brunello is highly regarded stuff in Italy, possibly the most well-respected of wines, something I already knew before going and was told often by many different older Italian men. Wine collectors seek it out and hold onto it for decades. With certain vintages, the price soars, 2004 for instance was already in the “Do Not Touch” section of several stores I visited. 2007 I was told, would be the next year like it, being what they called an “outstanding vintage.” Some of the wine shops we went to sold bottles of Brunello that I could never afford, however, I was glad to witness the range and felt blessed just to be in such a highly regarded place. While Josh and I brought back 14 bottles of Brunello di Montalcino, all produced by different vineyards, the Mozart vineyard was by far, my favorite place. They are bringing a simplicity to a high end product and a humbling experience in a very daunting place. It was wonderful to get the chance to experience such a delightful atmosphere. A place where we could be laid back and just enjoy. No one snobby telling us what to think or using intimidating lingo. Just a guy who really loves wine and music, telling us why his vineyard does what it does and hoping we would buy from him in the future. Well, we will. I will be a life long customer of his, forever remembering the way his little piece of the world made me feel. Take a visit for yourself by clicking the link below. You want it. You better fight for it.